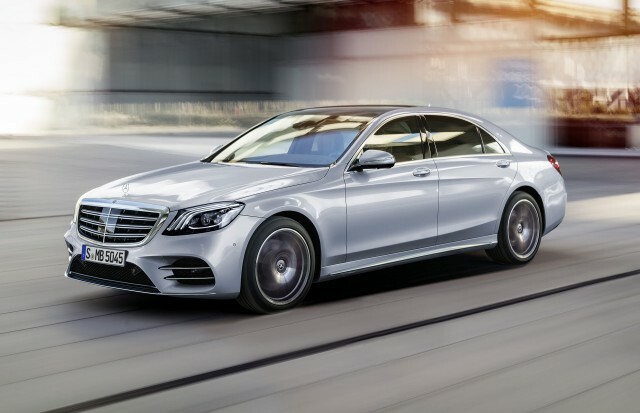 The 2018 Mercedes-Benz S-Class ushers in refreshed looks, new powertrains, and a repackaged interior, but the changes go further than skin deep. Specifically, Mercedes is ratcheting up the active safety features with the S-Class’ mid-cycle refresh. The nervous system of the entire driver assistance system is Mercedes-Benz “Intelligent Drive,” which gets better cameras and radar units that see farther down the road this time around. It notably adds Active Distance Assist Distronic. Distronic is the name for the brand’s adaptive cruise control, and this version now uses more map and navigation data to help control inputs for the driver, which allows the system to adjust vehicle speed on a route-specific basis. Better yet, it can slow the S-Class appropriately for bends, junctions, roundabouts, and even toll booths. Active Distance Assist Distronic will also decelerate the S-Class when approaching the route’s desired exit as long as the car is in the furthest right lane. Neato. The system has been calibrated to play with the transmission’s various driving modes as well: Eco, Comfort, Sport, and Individual. Cornering speeds and following distances are adjusted accordingly, too, with even greater speed ranges than the previous S-Class. Active Lane Change Assist checks the desired lane to make sure it is clear of obstructions in front of, behind, and alongside the S-Class. The driver simply nudges the turn signal stalk and the system will give the driver the OK on the instrument cluster and head-up display within seconds, then initiate the lane change. Would you expect it to stop there for one of the most luxurious sedans on the planet? Of course you wouldn’t. Active Speed Limit Assist recognizes local speeds in conjunction with the navigation system and by reading traffic signs, and can adjust speeds accordingly. Mercedes says Active Steering Assist, which autonomously steers the car to keep it in its lane, has been improved to keep a safe distance and make the steering safer. Active Emergency Stop Assist intervenes if the system detects the driver has not been operating the car. Active braking will stop the car in its lane, put on the hazard lights, and unlock the doors (possibly to allow emergency responders to render aid), should it detect the driver is no longer actively driving the car with Active Steering Assist engaged. Active Brake Assist with Cross-Traffic Function is a typical forward emergency braking system that also detects crossing traffic and pedestrians, warns the driver audibly and with lights, and applies the brakes to avoid or mitigate the severity of a crash. If that’s not enough Evasive Steering Assist can help. This system won’t activate on its own, but it will apply additional steering torque should the driver try to avoid hitting a detected pedestrian. Finally, Car-to-X communications can warn the driver of what’s ahead through Live Traffic and the COMAND system. Other cars with Car-to-X capability report this information and share it with others with the same capability. Each one of these systems is a small piece to the final puzzle: autonomous vehicles. Mercedes-Benz continues to seek out and develop technologies to ultimately create its goal of accident-free driving. In the meantime, the 2018 S-Class will serve as a lovely personal assistant.